Summertime weather around here has been seriously lacking. We had so little sunshine that I nearly forgot it was strawberry season around here! I'm no garden expert, but I figured strawberry plants needed sunshine to actually produce berries. Turns out they don't need much. I soon found myself hunched over at a u-pick strawberry farm gathering as many as I could. This year's crop was certainly different from last year's - not as big or sweet and not as perfectly shaped, but delicious nevertheless. Brilliantly red inside and just begging to be eaten in some form or another. Despite the cooler temperatures I'd already been making an abundance of ice cream, so naturally I was eager to use some of the freshly picked berries in yet another batch. I feel I must confess that I've not always been a fan of strawberry ice cream. In fact, as a child I wouldn't eat it. Didn't like it in the least. Anytime someone brought out the neopolitan ice cream, (which was often - was that an 80's thing?) I was instantly put off and disappointed in that extra little third of ice cream that I would be deprived of, albeit self imposed! I wanted to like it, I really did. Beautifully pink as it is, I longed to have it happily on my spoon only there was that little thing about the taste....I just couldn't like it. I tried, but every time, there was that lonely, pretty pink third of ice cream, melting away into a puddle on my plate. Well things have certainly changed. I'd like to thank Haagen Dazs for opening my eyes in my teenage years to the beauty that is strawberry ice cream. Oh, the beauty of it! Such luscious strawberry flavor, so creamy and smooth! When I set out to find a recipe, I had only one desire for the final outcome: it had to be smooth; no seeds or fruit chunks. Right away I recalled a recipe I saw from Pioneer Woman for blackberry ice cream that was smooth and seed free. Ding ding! We had a winner! The final product was a true thing of beauty. At first bite I thought, "Ohh, this is the best strawberry ice cream I've ever had!" 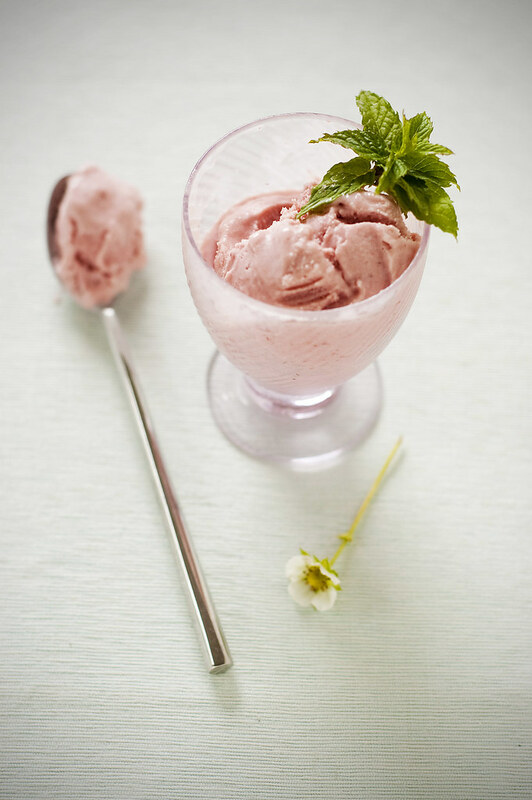 then in the back of my mind I remembered that Haagen Dazs and thought, "Oh, well, maybe the second best I've ever had but certainly the BEST strawberry ice cream *I've* ever made!" 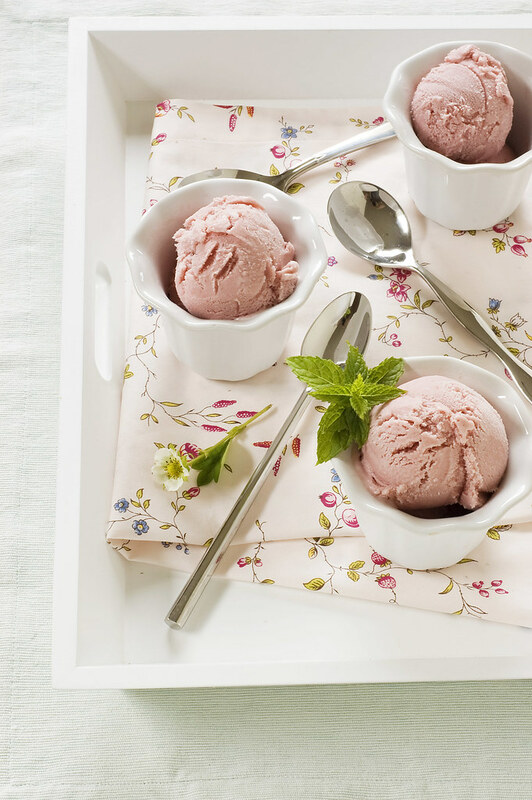 (okay, so it's the only strawberry ice cream I've ever made, but who cares? Minor detail, I say). You should try this. I promise, you'll be happy you did. 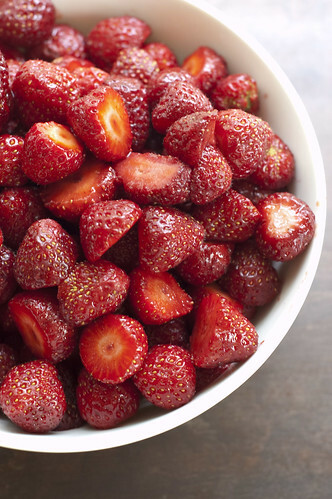 Hull your strawberries and add them with 1/4 cup sugar and the lemon juice to a medium saucepan. Cook over low heat for about 20-25 minutes. If you prefer seedless as I do, process your berries through a food mill. Set aside. Warm the whole milk and 1 cup of sugar in a saucepan over low heat. The goal here is simply to warm the mixture, not boil. Once warmed, remove from heat and set aside. Pour the heavy cream into a large bowl and place a strainer over it (you will be pouring your custard into this once it's finished cooking). Set aside. In the bowl of a stand mixer, beat the egg yolks until pale yellow and slightly thick, approximately 3-4 minutes. Temper the yolks by adding about 1 1/2 cups of the warmed milk and sugar mixture. Pour the tempered yolks back into the saucepan of warmed milk mixture and return to the stove on medium low heat. Cook until thickened to a custardy appearance, or until mixture coats the back of a spoon. (Dip the backside of a spoon into the mixture then drag your finger through the middle - you want the trail left to be clean and not run back into the mark you just made.) 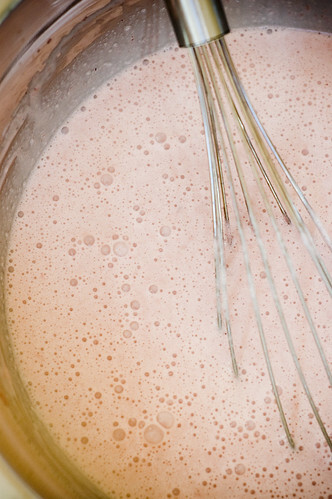 Watch your mixture closely as it can easily turn from custardy to curdled before you know it. Pour the custard into the heavy cream, being sure to strain it as you're pouring. 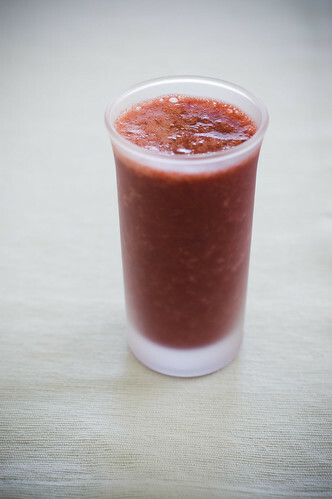 Add the strawberry puree and mix well. Freeze according to your ice cream maker's instructions. I love strawberry ice cream! That first photo is just GORGEOUS!!! This looks so rich and delicious! Summer really is all about ice cream!! I'm planning on making Chocolate Chip Cookie Ice Cream Cake this weekend. Or if I'm in the mood for strawberry, maybe I'll try yours! Thanks for sharing! Parabéns pelo seu blog, tem coisa lindas fiquei encantada. Vou voltar muitas vezes. Amazing. It's 54 degress in Southern California (translation: below freezing) and I have a sudden urge to go out for an ice cream cone. PS. 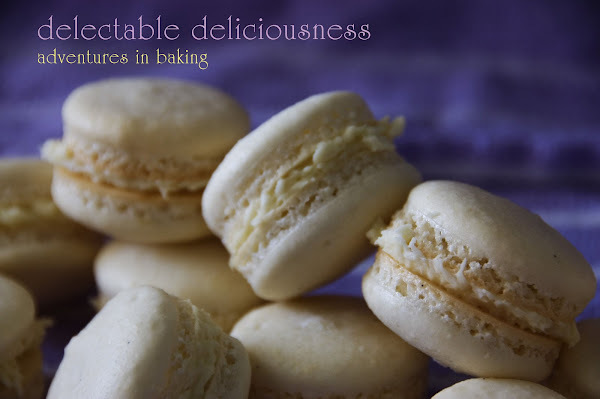 I used your recipe for macarons almost a year ago now, they were the most delicious thing I've ever tasted! I just found you!!! Beautiful blog!!!! I look forward to following you in my google reader.